Sea of Glass: 5th Bead Soup Blog Party Reveal! The 5th Party, but only my 2nd time. Here are the ingredients I received to create a soup! My BSBP partner, Jean from Eclectic Avenue, was so very generous, that I was able to make create 3 recipes! A better view of the pendant she wrapped. I didn't use all the components, so I made earrings! Did I mention Jean's generosity??? Still had beads, so I chose to make a bracelet. 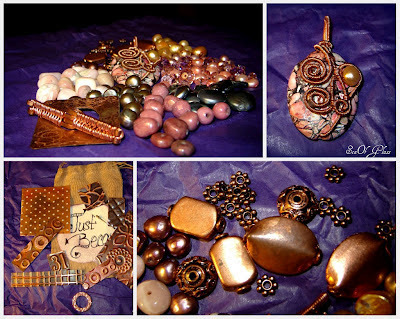 Having already used all the copper beads, I decided to do a little wrapping. These beads were a bit different for me, but much fun to work with. What do you think? If you'd like to continue the Blog Hop, choose a participant from the Linkytool below. You created a lovely set from gorgeous beads! You did a fantastic job with your soup. That focal is stunning, and the necklace you created for it shows it off perfectly. I would wear those earrings in a heartbeat, and I just have to sigh and drool over your wireworking on the bracelet. Wonderful designs, all. Oh, VERY nice... great job! You created a wonderful set of jewelry!!! WOW you did wonderful!!! I like it!! you can see I love pearls not only did you get pearls... I added them to mine too!! Hope you enjoyed working with the copper. your creations are truly eye candy! have fun wearing them, they're all gorgeous! Oh so nice! I love the color combination. That soft pink and grey is just perfect! Your partner was truly generous but you did a marvelous job with that soup all the same. Yumm-o. Fabulous creations, everything works so well together! Your necklace and bracelet are really beautiful and elegant, but your earrings are the ones I know I would wear. Lovely work all around! The wire work is amazing! You did justice to your soup, and I love your creativity! Oooo you lucky girl I love your soup and what you did with it, gorgeous! 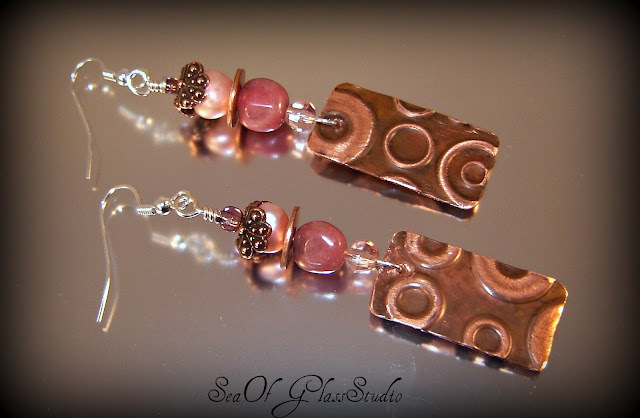 The pink, black, and gray tones of the focal and the other beads go so well with the copper. Cynthia, you did a wonderful job! All three pieces have such a feminin touch, and the wire work fits so well with all the other components! A combination I would wear immediately! Every piece is beautiful. 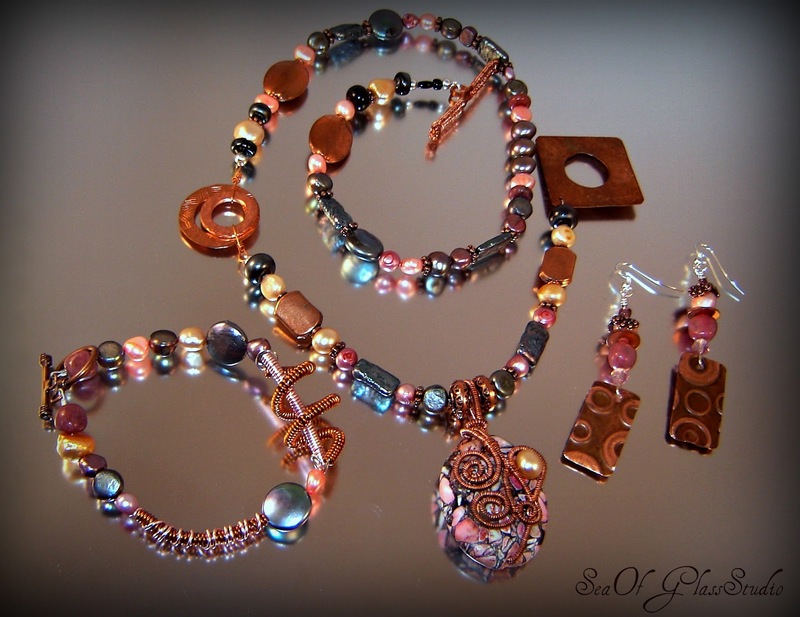 I'm loving the vibrant copper in each piece!! Very beautiful work! There's so much life in the colour and texture you've created! And your pieces look like fun to wear. I think I'd have a permanent smile on my face, they'd make me feel so good. The necklace is an original and stunning design, the colours work brilliantly together and your wirework is beautiful - these pieces are truly wearable art! I think fantastic! You've put together a group of truly beautiful pieces. The colors are great and I love the wirework you did on the bracelet. I think all of your pieces look wonderful. But the earrings are so cool with all the circles. Absolutely stunning pieces!! Beautiful work, amazing soup ingredients too! You have been busy! Your wirework is lovely, and you have made such beautiful pieces. Wonderful use of your soup! I love the colors - yummy! And your creations are beautiful! What a fantastic set you made from your soup. Love the colours!!! These lovely creations ate truly wearable art! Love the pink and gray combo, and the earrings I would wear all the time! Wonderful set. And I just love the bangle! Beautiful set! I really like the design, not least in the necklace and earrings. Great mix of shapes and an interesting colour mix. Fab job! I like everything that you made, but I am especially taken with the sweet earrings. Very great wire work, the pendant that you used is very pretty. I love the mix of beads that you used. Love the colors. You made it into a beautiful set. I love your designs and copper is my new favorite material to work with. I would love to wear that bracelet. Cheers! A truly stunning collection. Loving what you did with that bracelet! What a rich set you made! The necklase is wonderful. Such a rich, delicious color palette! I'm especially fond of the earrings. Beautiful set!!! Those earrings are too fun and that bracelet awesome!! Great work! I think the whole set is just stunning! I love how there's so much going on with all the different shapes and sizes, and yet, the design flows so perfectly! Beautiful work! Beautiful work. Love your wirewrapping. I love working with brass and copper. Really REALLY amazing pieces. I love the wrapped focal. I think this is so beautiful, I'm totally in love!! What a delicious blending of colors! 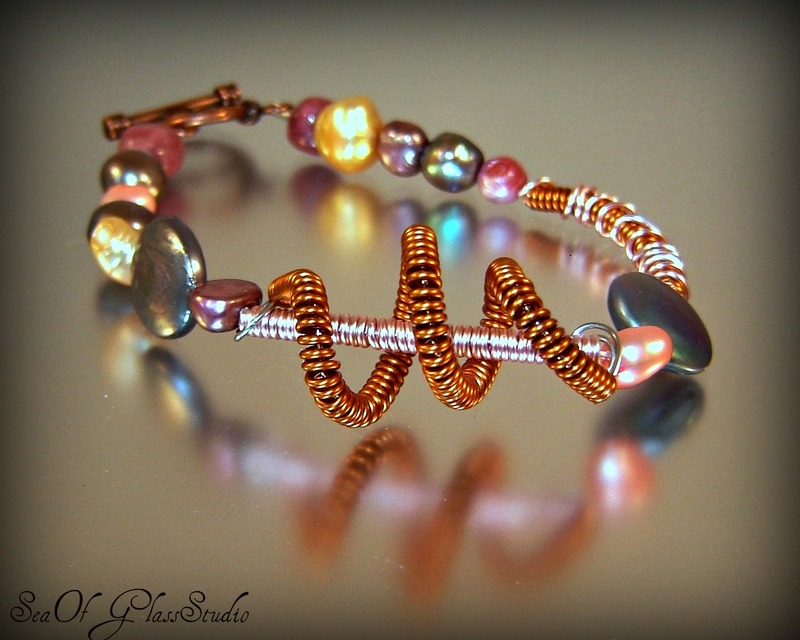 Your wire wrapping on that bracelet is SO COOL! And the earrings....lovely!!!! Everything you made is beautiful! 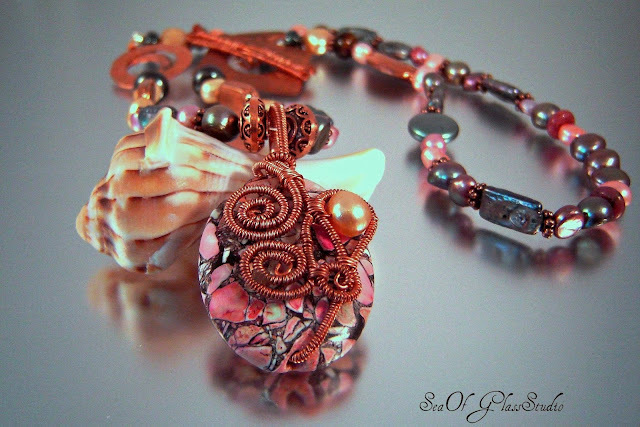 Love the copper and wire work! All your creations look terrific! Impressive wire wrapping, just beautiful. My favorite are the earrings, the copper dangles are gorgeous. Great soup you got there! Agree with all the comments about the wonderful wirework. While the necklace is a beaut, I think my favourite piece has got to be the earrings. Divine! What do we think, you ask. I think its beautiful. 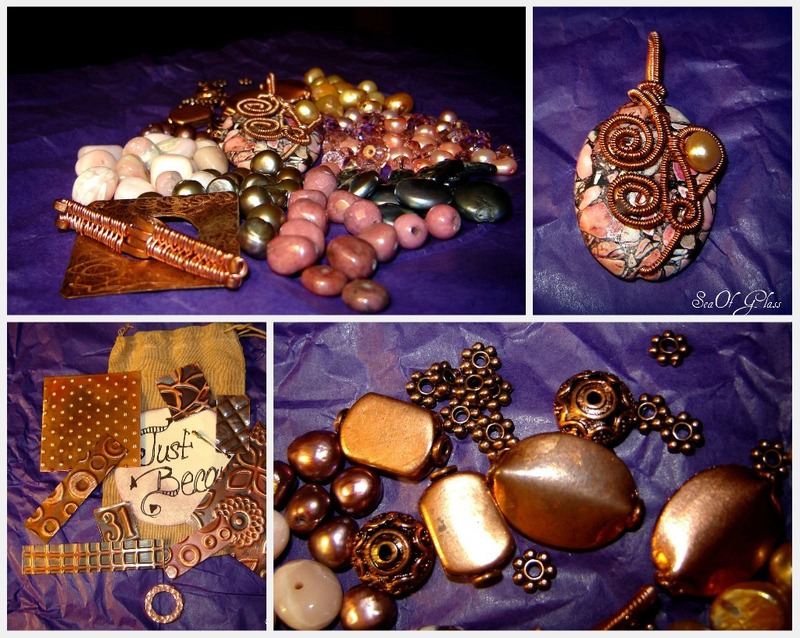 I think your use of pearls with the copper is great. All three pieces, while different with their own personality, are very cohesive. You hit a homer with these. Great job! I love this .... all the copper and the earthy colors, you did a fab job .. esp the 1st one with the asymmetrical design and the clasp on the side... wonderful! I think it is a lovely set - delicate, feminine, and (most of all) extremely pretty! The colours and texture mix are gorgeous! What a gorgeous pendant, and what a beautiful necklace and complete set you created. Really pretty! I love the focal piece and how you used it! Great set, beautiful. Wonderful wire work by both you and your partner. Love the colors. Still hopping :-)...very nice pieces! The colors you received are unusually nice, and you did a marvellous job with them.